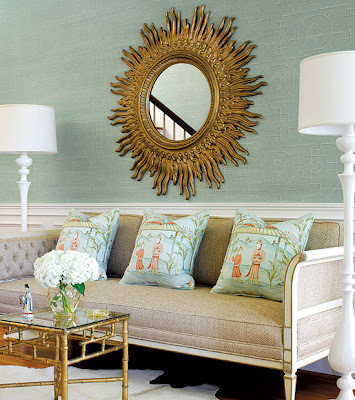 Blue Artichoke Interiors: Be Still My Heart- I Found the Wall Covering of My Dreams! Be Still My Heart- I Found the Wall Covering of My Dreams! 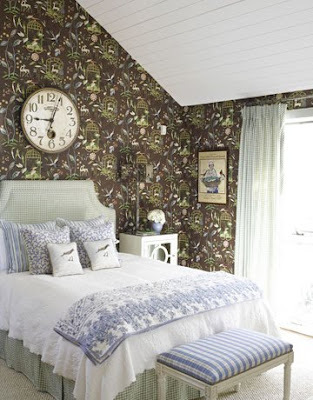 In the June issue of Country Living, a pretty seaside bedroom picture caught my eye. I love this look with the white quilt, the lovely Brunschwig & Fils green gingham checked fabric, and the crisp blue and white accent fabrics. 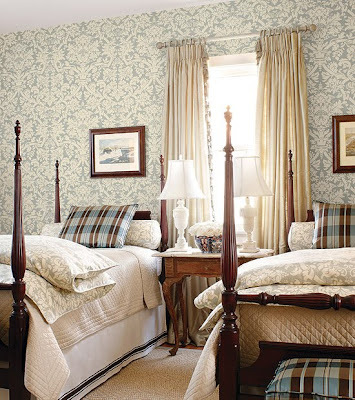 However, what stole the show for me is this yummy chocolate brown wall covering by Thibaut. 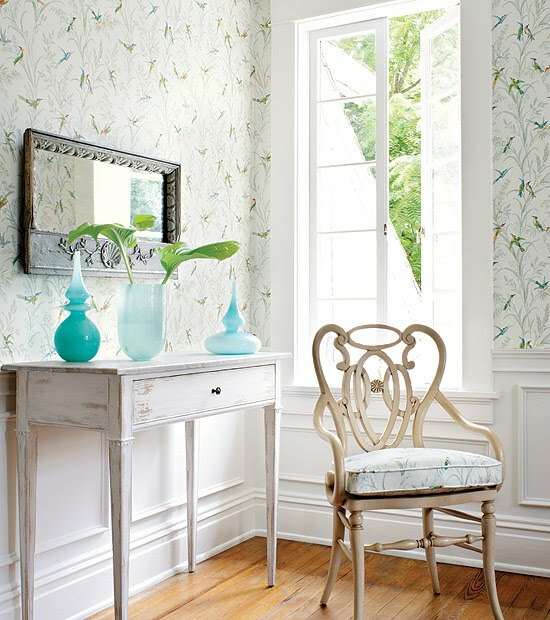 This beautiful paper is the Providence brown from the Serendipity collection. It comes in six different color ways, but in my humble opinion the brown is the prettiest of them all. Thibaut has long been one of my favorite wall coverings company. They have many wonderful companion fabrics to coordinate the look of your room. Here are a few new papers from their recent collections. I love these images from their Shangri-La collection. 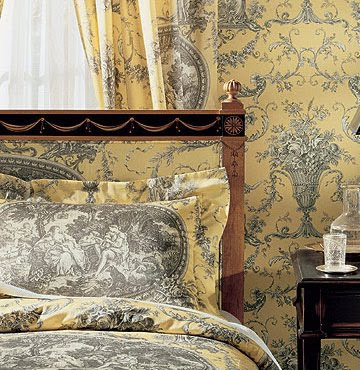 Here are some lovely choices from their Toile Portfolio collection. 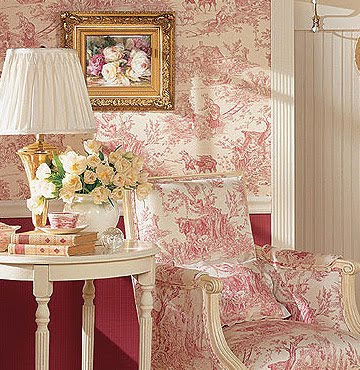 You know how I L-O-V-E toile. I think the Gatehouse Collection is stunning too. I love the birds. 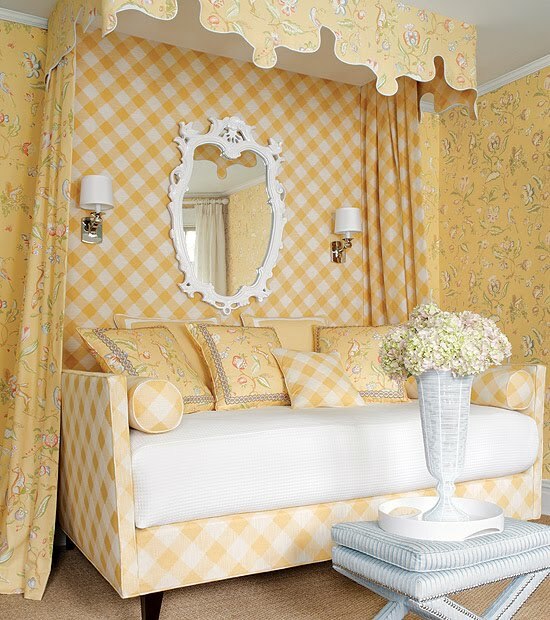 Here's a couple more from Thibaut's Residence collection. 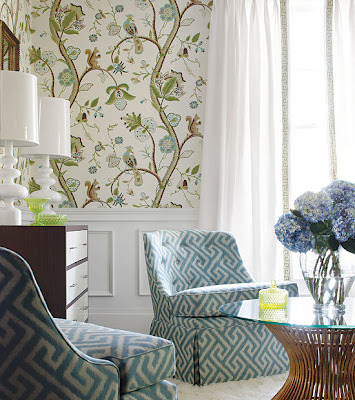 There are so many beautiful wall coverings and fabrics to absolutely swoon over. Head over to the Thibaut web site to take a look for yourself. Now that you know what one of my favorite wall covering companies is, why don't you share yours with me? Gorgeous! I am afraid to go over there...I will want to wallpaper my whole house! Love that shade of chocolate! I used it in the bedroom of one of my previous houses. Beautiful and surprisingly soothing. I would choose the brown! 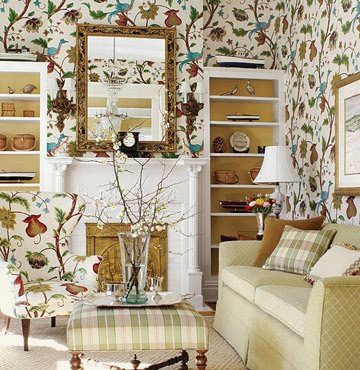 Oh how I love wallpaper. I have to reel myself back in or I will have it everywhere again!! 15 years ago when we built our house, I had it in the kitchen, powder room, boys bathroom and borders in all the bedrooms!!! Whoa!! Now I just have an accent wall in the family room. These wall coverings make me smile! So simple... such a statement! These wall coverings are SO pretty! I would go nuts with them if I ever started.